Are you experiencing difficulty recovering the debt? 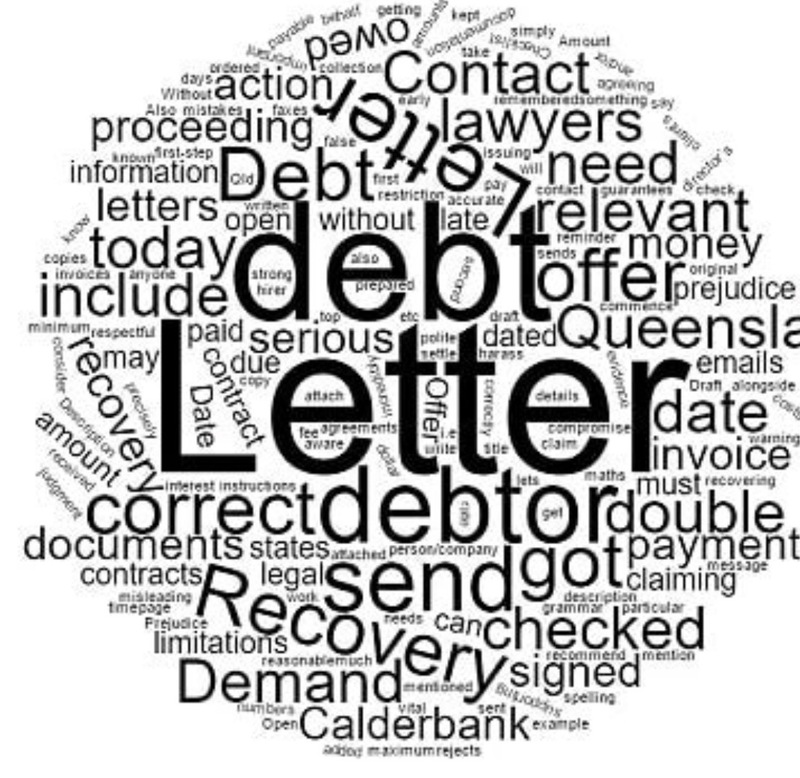 SCB Legal comprises an experienced team of debt recovery solicitors servicing the greater Sydney area. Our expertise and commitment, assisting both small and large companies to recover monies owed to them, is something on which we pride ourselves. We understand the enormous strain and uncertainty that a business faces when it is owed money. It’s a precarious situation when you’ve worked hard tending to a client’s needs only to discover that the bill is still outstanding. What can you do? Endless emails, multiple phone calls, constantly having to remind yourself to follow up and write yet another email is at best, frustrating. Countless hours are often spent agonising about what measures you can take to ensure your invoices get paid. When you hire a qualified debt recovery lawyer, armed with knowledge and dedication, an actionable plan can be created, so that a successful outcome ensues. If a company or individual owes you money, many people query what rights they have. If the business is simply refusing to pay, it is highly recommended that you engage a solicitor and seek legal advice on what is the best course of action to take. If the debt is greater than $1,000, the solicitor may ask the debtor to pay interest on the money owed, as well as paying for all legal costs. The first step a solicitor usually takes is preparing a Letter of Demand. Would You Like To Know How To Collect A Debt From A Client? We are experienced in debt recovery, so irrespective of the amount, contact us today to recover what is owed. 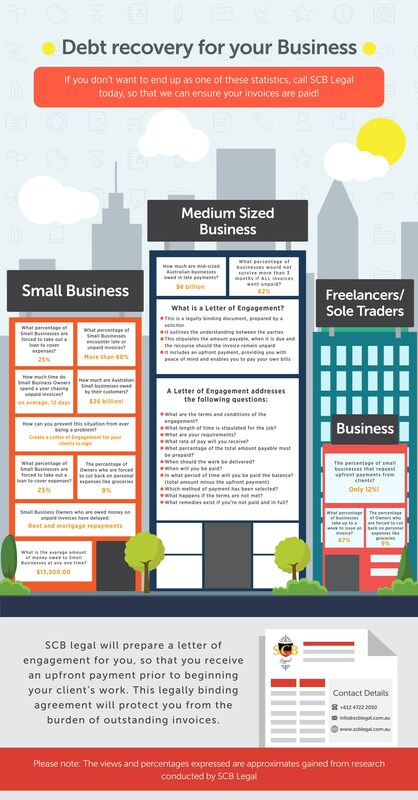 How To Collect Money Owed To A Small Business? Many small business owners spend nights lying awake worrying about bills that haven’t been paid. It difficult enough paying one’s own bills than having to contend with the fact thatcompanies and or individuals owe your company money. SCB Legal removes the frustration and concern by creating a plan of action to recoup your outstanding fees. Would You Like Your Outstanding Payments To Become A Thing Of The Past? Let SCB Legal take the worry out of recovering debt. Call now to arrange a time to speak with one of our highly qualified debt recovery solicitors. The first step is to ask the person that owes the money why they haven’t paid. It’s important to rule out the possibility that a failure to pay is the result of a simple misunderstanding. What Is A Late Payment Demand? A late payment demand is formally referred to as a Letter of Demand. This formal notice, otherwise known as a Demand letter, is sent after trying unsuccessfully, to recoup outstanding amounts, payments that are in debt. It encourages the party to pay the debt promptly, in order to avoid further action being taken. The Letter of Demand is the final reminder given to the other party, before taking a more serious action where this becomes a legal matter with possible court proceedings. This formally warns the party that the monies owed must be paid, specifying the amount by a certain date and notifying the party that court proceedings will begin should they fail to comply. A Letter of Demand must be sent before a claim for the debt can be lodged with the court. Hiring a lawyer to prepare a Letter of Demand is by design, the most persuasive way you can recoup your money in the most cost effective manner. Often, when a party receives a notice that has been prepared on the law firm’s company letterhead and is signed by a solicitor, the party is more encouraged to act and swiftly. This valuable tool can help you avoid spending money going to court. Do You Need A Letter of Demand Prepared So That You Can Avoid Costly And Time-Consuming Court Proceedings? Contact us now, so that we can gather all the necessary facts and begin drafting your formal notice. Why Send A Final Warning Letter Template Before Legal Action? This clearly states your intention to commence legal proceedings if the debt is not paid. What Should I Do If I Receive A Demand Letter? What If I Cannot Pay The Outstanding Amount? If you are unable to pay the full amount, you can negotiate with the creditor and request an extension of time to pay the amount. Alternatively, a negotiation can be made to start a payment plan, thereby paying off the debt in instalments. In some cases, you can negotiate a smaller amount be paid in full to finalise the debt or request to have the debt removed completely. To start the court proceedings for debt collection, a solicitor will file a Statement of Claim. The person being issued it usually has 28 days to take action after it is served. If a party is sent one and ignores it, the creditor can apply to the court for a judgement against them. How Should I Respond To A Statement Of Claim? Does A Time Frame Exist For Serving A Statement Of Claim? Yes. A Statement of Claim must be served within 6 months of filing the claim. In What Period Of Time Is A Party Required To Respond? Would You Like So See Your Long-Standing Debts Actually Be Paid? Contact one of our professional debt recovery lawyers today, so that we can ease the burden for you! Certain circumstances lead to the matter be handled in court. What Is The Process For Taking A Claim To Court? If you are owed money and are taking it to court, the court needs to have all evidence in writing beforehand. This includes any written statements from any witnesses that can support the case. Would you like an SCB Legal solicitor to help you prepare the necessary documents? Once the hearing has started, the court will give both the creditor and debtor a chance to plead their case. The court will ask questions and seek clarification on any information provided, before arriving at a decision. If the court rules in favour of the creditor, the debtor has to pay them the judgment debt immediately and in addition, will have to pay their legal fees. What Happens If The Judgement Debt Isn’t Paid? Make the debtor return to court, explain their financial position and explain why they have not paid. In this scenario it’s possible for the debtor to be declared bankrupt. Order an officer of the court to seize the debtor’s goods and sell them to raise enough money to pay back the debt. This is referred to as a writ for levy of property. What If You Don’t Owe Or Cannot Pay The Debt? If you believe that you don’t owe the money or if you’re not 100% sure, it is best to seek legal advice from a solicitor, so they can dispute the debt for you or stop legal proceedings from starting. If the dispute ends up in court and you’re still obligated to pay, you may be liable for extra interest on top, as well as legal fees. Therefore, it is always better to have these disputes settled out of court. If you cannot pay the debts, your solicitor can help negotiate payment arrangements with the people you owe. Payment arrangements may be smaller amounts that are paid towards the total debt owed over a longer period of time. 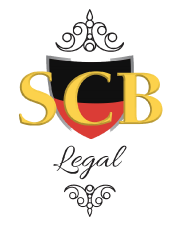 Contact SCB Legal TODAY To EnsureYou Receive The Best Legal Advice! Sometimes and unfortunately, businesses who do not pay their debts, only take the matter seriously when threatened by bankruptcy proceedings. In order to commence bankruptcy proceedings against a debtor, certain criteria must be met. including interest and costs incurred. Documents must be personally served on the debtor. It is important to note that the debtor’s registered business address must be known and the debtor needs to be identifiable. Checking with your solicitor as to whether the party has available monies, in order to make funds available to pay the debt. For example, the debtor may have real estate holdings that when liquified can provide a source of payment. What Is Bankruptcy And Insolvency? Bankruptcy is a term used in relation to individuals, whereas insolvency is used in regard to companies. When an individual or business cannot pay their debts, they relinquish their assets and control of their finances in order to meet the demands of their debt, in exchange for suffering legal action taken by creditors. What consequences result when a person/business is declared bankrupt? Are you a business who has tried desperately to recoup debt? SCB Legal’s dedicated team of debt recovery solicitors will help you recover debt. Call us to begin the process and remove the uncertainty and worry.